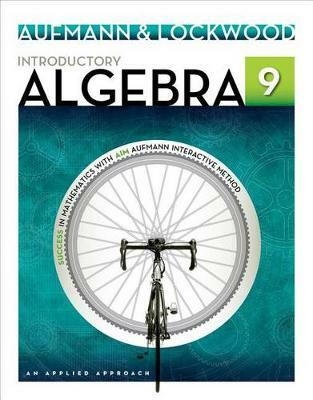 As in previous editions, the focus in INTRODUCTORY ALGEBRA remains on the Aufmann Interactive Method (AIM). Students are encouraged to be active participants in the classroom and in their own studies as they work through the How To examples and the paired Examples and You Try It problems. Student engagement is crucial to success. Presenting students with worked examples, and then providing them with the opportunity to immediately solve similar problems, helps them build their confidence and eventually master the concepts. Simplicity is key in the organization of this edition, as in all other editions. All lessons, exercise sets, tests, and supplements are organized around a carefully constructed hierarchy of objectives. Each exercise mirrors a preceding objective, which helps to reinforce key concepts and promote skill building. This clear, objective-based approach allows students to organize their thoughts around the content, and supports instructors as they work to design syllabi, lesson plans, and other administrative documents. New features like Focus on Success, Apply the Concept, and Concept Check add an increased emphasis on study skills and conceptual understanding to strengthen the foundation of student success. The Ninth Edition also features a new design, enhancing the Aufmann Interactive Method and making the pages easier for both students and instructors to follow. Available with InfoTrac© Student Collections http://gocengage.com/infotrac.